Tanking as its name suggests is the formation of unbroken waterproof tank to an area of a building which is commonly under ground. The tank is formed by the application of waterproof material to the walls and the floors of the structure, either internally or externally. We create dry environments which can be effectively insulated to meet current building regulations. In flood damaged properties, tanking can be used to speed up drying out to re-occupancy timeline and on new build provides an excellent primary waterproofing system when used with a cavity drainage membrane. 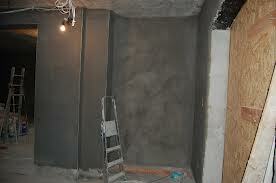 Our high performance cementitious tanking membrane, which effectively stops water from penetrating the substrate. 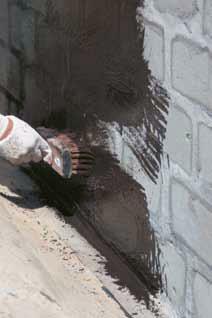 Most surfaces require a polymer modified render coat to applied prior the final tanking membrane to ensure sound adhesion. Once cured it forms an extremely reliable waterproofing membrane in its own right, making it the perfect primary waterproofing solution. An absolutely essential component of our Tanking System is Anti-Sulphate. It must be applied wherever ground water has penetrated. This is because ground water contains sulphates and chlorides which degrade Tanking materials. Anti-Sulphate effectively and easily neutralises this damaging source of contamination. As an integral part of our Basement Tanking System we are using special Barrier Mortar, which is primarily used to seal wall to floor joints. This is highly effective Waterproof Membrane. If you require Basement Tanking / Waterproof Membrane give us a call on 077141 87053 or book your Free Survey and we will come and help you to deal with it. 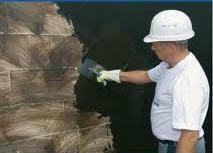 We can create highly effective Waterproof Membrane up to 2,5 meter below the ground. Our revolutionary Floor Membrane will stop damp from coming through the floor without the need for uplifting concrete. The advantages compared with digging up the concrete and laying in a conventional DPM are obvious - PHENOMENAL TIME AND COST SAVING AND MINIMUM DISRUPTION.